watching Australia's major sporting events like the Australian Grand Prix, the Australian Open and the Melbourne Cup. 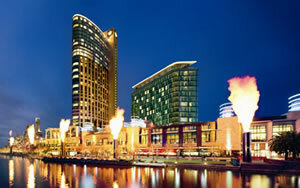 A short walk from many city center sights, the Melbourne Aquarium is one of the country's top attractions. 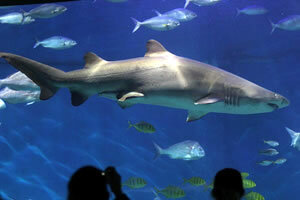 You'll need at least two hours for a tour of the place including the 360° Oceanarium. There you'll see giant sharks and string rays being fed every day. There's also the Great Barrier Reef exhibit, touch pools and a coral atoll. Stand in awe at the architectural wonder that is Fed Square, a civic center of over 3 hectares with open squares and a covered Atrium. 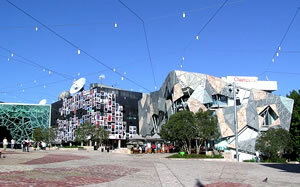 Built above railway lines, Fed Square houses the Ian Potter Centre, with a comprehensive history of Australian art and the Australian Centre for the Moving Image, which highlights film, television and digital culture. More than 2,000 events are held every year at Fed Square including festivals, exhibitions, performances, films, concerts and fashion shows. You name it, chances are you'll find it at Fed Square. This is where all Melbourne goes to shop. 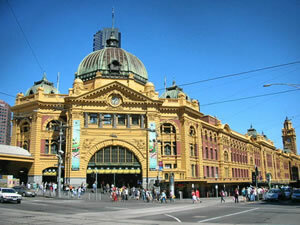 Opened in 1878, it's a landmark, tourist attraction and shopping center all in one. 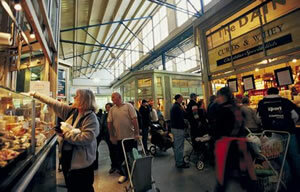 Here you'll find fresh seafood, fruits and veggies, clothing, toys, jewelry and much more. On the bank of the Yarra River lies Melbourne's top entertainment center that beckons to almost 20 million visitors a year. It has three 5-star hotels, one of the hemisphere's largest casinos, almost 50 restaurants, cafes and bars, two nightclubs, cinemas, an amusement park and a theater for live shows. A visit to the Complex is an experience you won't ever forget.